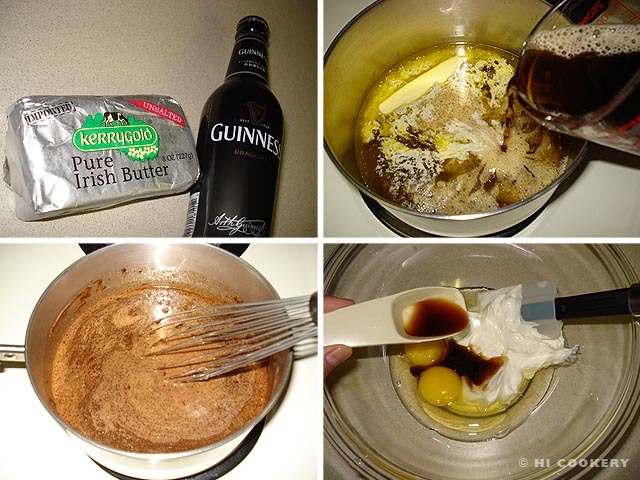 Irish beer, Irish butter, Irish cream. The trinity of these traditional Irish ingredients is included in a contemporary chocolate cupcake recipe for the Feast Day of St. Patrick, the patron of Ireland. Legend states that he used the shamrock to explain about the Holy Trinity when he converted the Irish pagans and Druids to Christianity. We baked these “spirited” shamrock-sprinkled sweets for a St. Patrick’s celebration at Islander’s brother’s Catholic university. The cupcakes were a festive dessert that provided not only food for thought about Irish cuisine, culture, politics and religion but also an opportunity for campus ministers to teach students about the trinity and our faith, much like St. Patrick did in Ireland in the fifth century. In a small saucepan, melt the butter over low heat and pour in the beer. Whisk in the cocoa powder and sugar and mix until smooth. Remove from heat and cool slightly. In a large mixing bowl, beat the eggs with the sour cream and vanilla. Pour in the beer mixture and blend well. Gradually add the flour and baking soda and mix the batter until smooth. 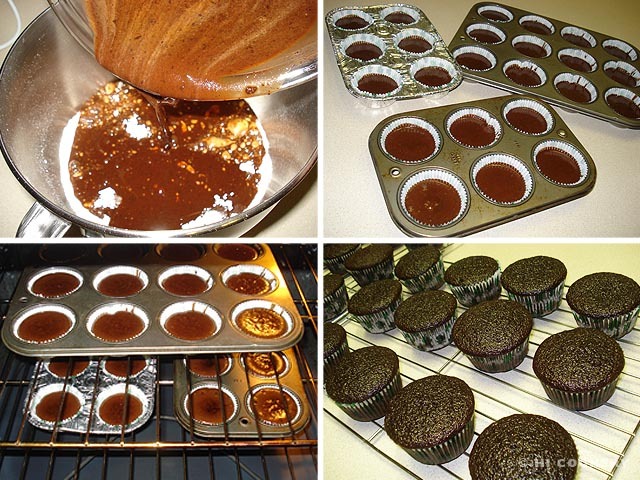 Scoop into muffin tins lined with cupcake papers. Bake in a preheated oven at 350 degrees F for 15-20 minutes. Remove from the oven and let cool in the muffin tins for another 15 minutes. Transfer to a wire rack to cool completely. Make the frosting. Cream the butter with a mixer paddle. Gradually add the powdered sugar, mixing until the frosting is smooth. 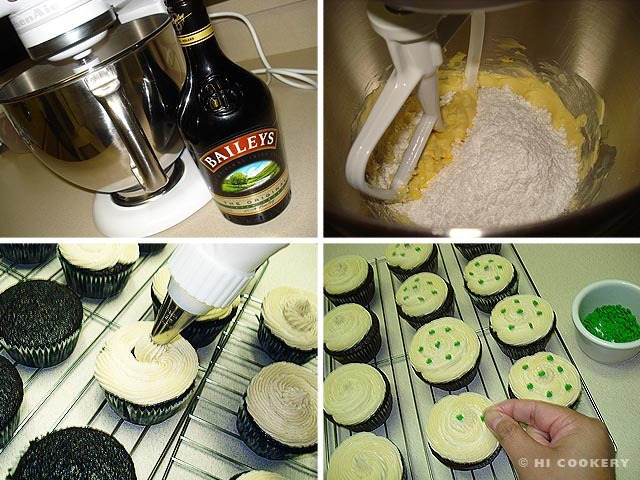 Pour in the Bailey’s Irish Cream until the frosting is at a spreadable consistency. Fill a pastry bag and pipe the frosting on top of each cupcake. Decorate with shamrock-shaped sprinkles. Yield: Approximately two dozen cupcakes. The cupcakes are moist and aromatic. 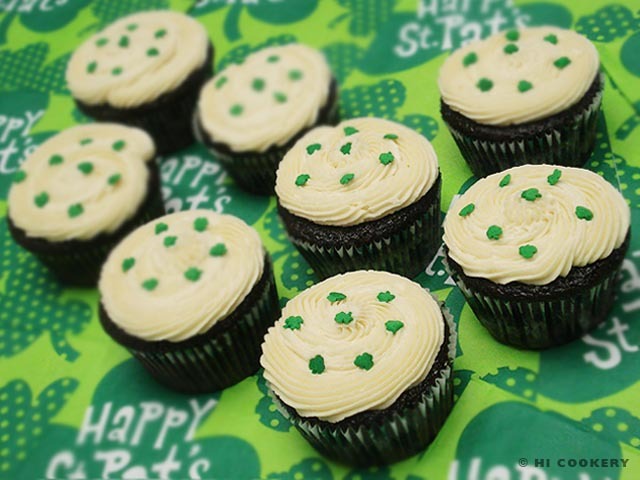 The Guinness beer’s sourness is balanced by the Bailey’s Irish cream frosting’s sweetness.